More than 90% of the population doesn't even spare a second thought for their use of the bathroom. It's a place they go to empty their bladder. End of story. For those of us with Shy Bladder, it's the Arena. It's where we go to struggle with our demons. Does that look like hell to you? It does to me and to many other men with Shy Bladder. See the one in the middle? I hope to be able to step up to one like that someday in a crowded public restroom, with people using the urinals either side and with people waiting their turn behind me. I'll simply walk up, urinate and walk away. 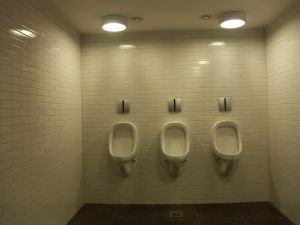 Nobody will notice because people don't look you in the eye in the mensroom, but I'll have a big victorious smile on my face and 20 years of self-doubt and avoidance will be over. I'll be normal again. I have a simple plan for how I'm going to do it.